For years there has been a dialogue between physicians and their infertile patients about whether stress is a cause of infertility or the result of infertility. Current research has shown that the stress levels of women with infertility are equivalent to women with cancer, AIDS or heart disease, so there is no question about infertility resulting in enormous stress. The breaking news published online in the journal Fertility and Sterility and summarized this week in the Science section of the New York Times, ( Old Maxim of Fertility and Stress Is Reversed ) is that women who stopped using contraceptives took longer to become pregnant if they had higher saliva levels of the enzyme alpha-amylase -- a biological indicator of stress. Specifically, women with the highest concentrations of alpha-amylase were 12 percent less likely to become pregnant each month than those with the lowest levels. So what are the implications of this new research? The researchers say theirs is the first study to link a biomarker for stress with delayed conception in normal, healthy women, and they suggest that identifying ways to reduce or manage stress may be a low-tech solution for some couples diagnosed with infertility. Alice Domar, executive director of the Domar Center for Mind/Body Health at the fertility center Boston IVF, responded to the research findings by saying "This is one more piece of the puzzle that's adding up to the same conclusion: that stress is not necessarily a good thing for our reproductive system." 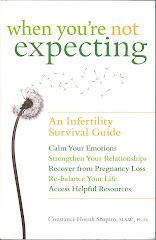 Her 2004 book, Conquering Infertility, addresses the mind/body connection and suggests practices ranging from mindful meditation to yoga that can help women reduce the stress caused by their infertility. So we are coming full circle: acknowledging the obvious, that infertility causes stress, and now addressing the scientific evidence that stress delays time of conception in healthy women. The researchers remind us that stress is the one consistent factor that shows an effect on how long it takes to get pregnant, of all the lifestyle factors studied to date. More surprising is that even low levels of stress can have an impact on conception. Dr. Domar advocates that mind/body techniques can decrease physical symptoms of stress such as insomnia, headaches, abdominal pain and fatigue as well as psychological symptoms such as depression, anxiety, hostility and tearfulness. She cites recent research that has shown that women who participate in mind/body programs in conjunction with treatment from their physician have significantly higher pregnancy rates than women who receive medical treatment only. With these intriguing studies, if you are a woman hoping to become pregnant (remember that the alpha-amylase study used data from 274 healthy women who had just started trying to conceive), certainly you will want to reduce your stress as much as possible in an effort to enhance conception. If you have been diagnosed with infertility, you are already in the midst of a stressful experience; seeking an infertility clinic that incorporates counseling, mind/body interventions and stress management strategies can provide you with new stress reduction techniques. In my book When You're Not Expecting, I provide information on how to locate a counselor or a support group, as well as lists of resources for help with mental health concerns, including stress. Each of our responses to the stress of infertility is unique to our particular circumstances. Yet this recent research is a red flag that we should actively try to address our own stress levels in an effort to assist our physicians in their efforts to help us achieve a healthy pregnancy.